An elevated hive stand is exactly what it sounds like: an item you use to hold a beehive off the ground. Many beekeepers put all of their hives on this kind of stand. The figure shows plans to help you build your own elevated hive stand. The dimensions of this stand are ideal for a Langstroth hive (eight or ten frame), a Warre hivé, or to hold a couple of five‐frame nuc hives. The generous top surface not only accommodates the hive, but there’s some extra surface area to place your smoker, tools, and the frames you remove for inspection. The table lists what you need to build this elevated hive stand. 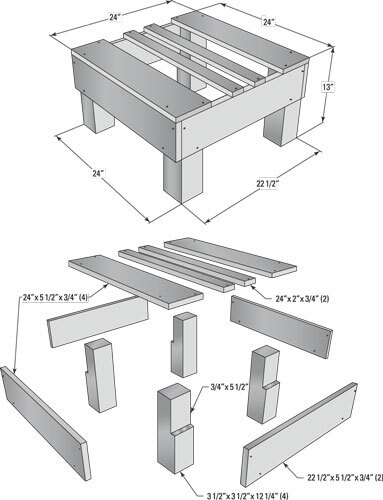 This section breaks down the elevated hive stand into its individual components, and the table provides instructions on how to cut and assemble those components. 2 1 x 6 of cedar or pine 24″ x 2″ x 3/4″ These are the narrow struts for the top. 2 1 x 6 of cedar or pine 22-1/2″ x 5-1/2″ x 3/4″ These are the short sides of the stand. You can adjust the stand’s height to suit your needs by adjusting the length of the 4‐inch by 4‐inch cedar posts. Longer legs result in less bending over during inspections. But keep in mind that the higher the stand, the higher your honey supers will be, potentially making it more difficult to lift the heavy, honey‐laden supers off the hive.